At Rogers & Andrews Orthodontics, our years of experience in family orthodontics empower us to provide truly world-class solutions to any type of issue. Orthodontists refer to the underbite as a prognathic lower jaw (mandible) or as a retrognathic upper jaw (maxilla). In layman terms, this is a case where the upper teeth are behind the lower teeth (anterior crossbite). These cases are best treated at an early age because once the bone sutures develop and close, the upper jaw cannot be moved forward as easily. Treatment usually involves a reverse-pull headgear attached to an upper expansion appliance. Some patients still require orthognathic surgery (jaw surgery) even after wearing the reverse pull headgear. Proper chewing is impacted by this type of bite, in which the upper and lower front teeth do not overlap. An openbite may cause a number of unwanted habits, such as tongue thrusting or thumb sucking. An early evaluation and intervention is essential in correcting an openbite. A pegged tooth is typically a lateral incisor that is shaped like a peg. This occurs when the upper front teeth do not develop correctly. Treatment for pegged teeth can include covering the tooth with a crown, or veneer, orthodontic treatment or removing the tooth and replacing it with an implant. Our practice has treated many cleft palate patients, and we have found the outcomes to be very rewarding both for our patients and our staff. These cases require expanding the palate to a normal width usually followed by bone grafting. It usually requires two to three stages, and we work closely with the general dentist, the oral surgeon, and the plastic surgeon. Impacted cuspids are a fairly common orthodontic problem. They are exposed and bone is removed to create a channel to allow the tooth to be moved into the arch using orthodontic forces. The usual method used to attach to the impacted tooth is a bonded pad and chain. Sometimes the tooth has to be moved to the mesial or the distal to avoid the roots of the adjoining teeth before the tooth is moved into the arch. 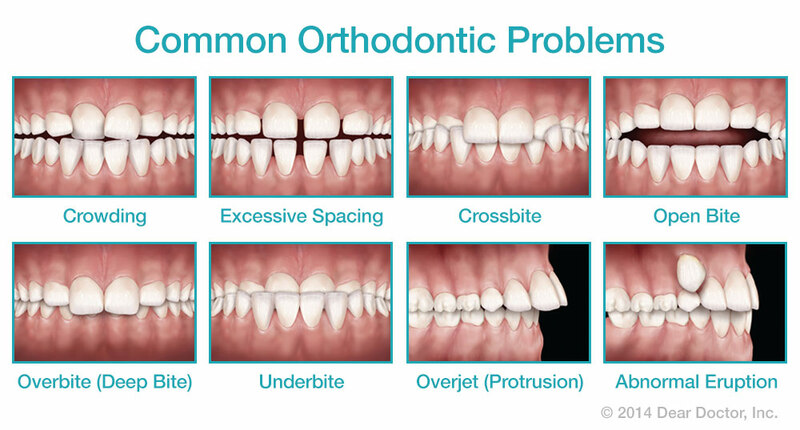 With modern surgical techniques and orthodontic treatment, alignment is almost always successful. With a crossbite, the upper teeth sit inside the lower teeth, which may cause tooth stratification and misaligned jaw growth. In order to close the mouth, patients usually move their lower jaw forward or to the side when closing. This incorrect bite results in an improper use of the lower jaws and sometimes brings about facial asymmetry. It is interesting to note that most crossbites that are treated before puberty do not require surgery. Third molars (wisdom teeth) usually cannot be kept due to the lack of space in the back of the mouth. The third molars are usually extracted between the ages of 14-21. Some oral surgeons prefer to extract them early before the roots develop since this usually makes the extraction easier and less complicated.